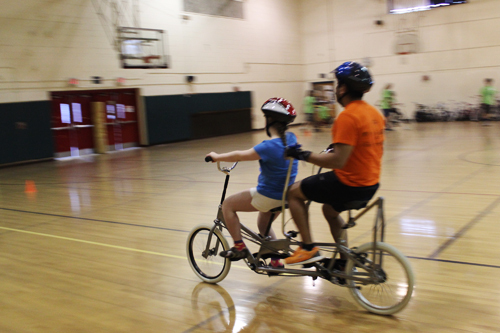 This blog is about a special bicycle camp that is being held in Arlington this week. Breakstone, White & Gluck was happy to donate bike helmets to support the iCan Shine Bike Camp, which fills a very important need and teaches children with disabilities how to ride bicycles. Please read about the camp, its organizer Nina Fischer and all the energetic and skilled instructors and volunteers. This April school vacation was not a traditional break for two dozen children in Arlington. 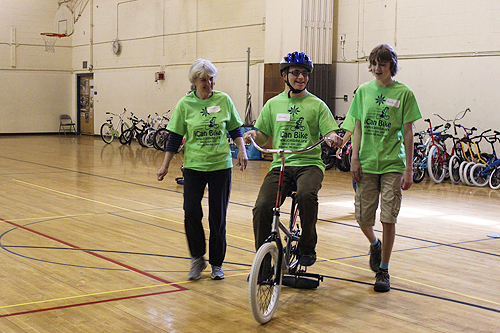 These children with disabilities spent their time off hard at work, learning how to ride bicycles at the iCan Shine Bike Camp at the Ottoson Middle School. 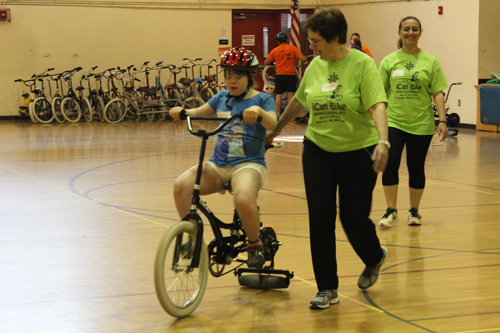 Children with disabilities do not have as many options for learning to ride and it is especially important in communities near Boston where cycling is so popular, said Nina Fischer, the camp’s organizer. Fischer tried to get her daughter who has cerebral palsy into bike camps for three years (including one as far away as New Jersey) before being approached to organize an iCan Shine Bike Camp locally. 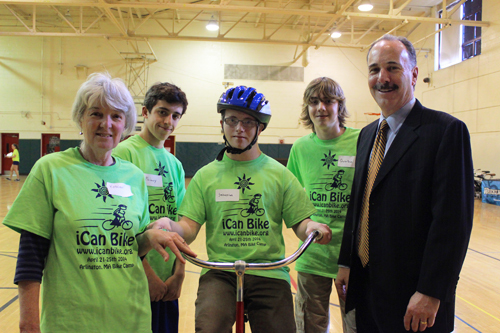 iCan Shine is a national non-profit organization which teaches children with disabilities how to ride bicycles. Each year, it hosts nearly 100 camps in 32 states. Fischer said the children come ready to learn from professional instructors from the iCan Shine national organization. Add in supportive parents and volunteers who agree to guide the children on bikes five days in a row, and the combination all proves very successful. Fischer organized the first Arlington camp last year and her daughter participated. But this year, her daughter decided she had learned enough not to come back. According to the national organization’s website, about 80 percent of the children can successfully ride bikes independently by the end of the five-day camp. Nationwide, about 35 percent of the participants have Down Syndrome, 35 percent are on the Autism Spectrum and the rest have other diagnosis, Fischer said. We attended on Tandem Tuesday, when the national instructors gave each child a turn riding on the front of the tandem bike. An instructor sat on the back seat to assess the child’s steering ability and strength. 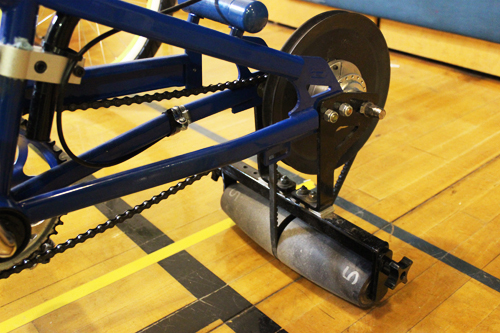 We also got to see the children make their way around the school gym with the specialized adaptive rear wheel equipment. These wheels are developed from research by Dr. Richard Klein at the University of Illinois. They are now made by his company Rainbow Trainers, Inc.
To help the children learn cycling, over the course of a few hours, the iCan Shine instructors change the strength of the bicycle rear tires up to 8 or 10 times. The children are not supposed to know about the change and are encouraged to get a cup of water or take a short break while the change happens. While using these special rear wheels, children are riding bikes provided by the national iCan Shine organization. These bikes have no brakes. The children rely solely on their own steering and the volunteers to guide them. By mid-week, the children progress to two-wheel bikes with brakes. Later in the week, the instructors will start to work with Belmont Wheelworks and the children’s parents on ordering bikes which will best suit each child. They then take the bikes to the gym to practice with the iCan Shine instructors. Breakstone, White & Gluck, a Boston personal injury law firm, encourages all cyclists to wear bike helmets to reduce the risk of serious head injuries while riding. According to the Centers for Disease Control and Prevention, bicyclists face a higher risk of crash-related injuries than drivers and occupants of motor vehicles. Children ages 5-14 and young adults ages 15-24 have the highest rates of non-fatal bicycle related injuries and account for 60 percent of all bike-related injuries seen in U.S. hospital emergency rooms. In 2013, we were proud to donate over 1,000 bike helmets to children in the Boston area. We are donating more helmets this year. To learn more about our bicycle safety outreach, visit www.bwglaw.com/bikes. We also invite you to follow our Facebook page.